Here our Creative Director Sally Storey shares her knowledge to bring you tips on how to achieve layered lighting in your home. 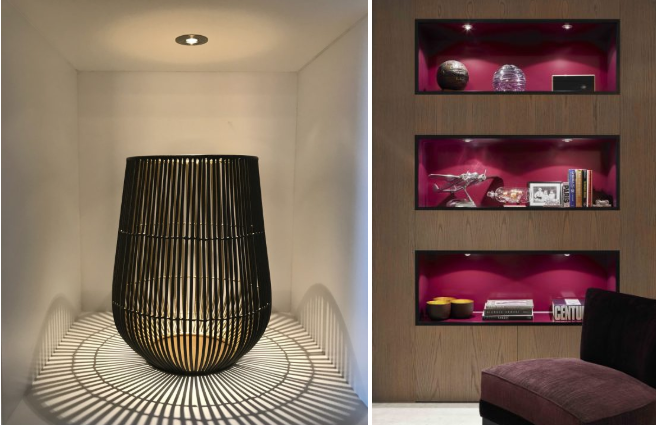 “Layering light is as important to a Lighting Designer as playing with texture, colour and materials is to an Interior Designer when it comes to enhancing a scheme. Layering light creates a more flexible lighting scheme which allows you to adapt the lighting to suit the different activities in that space. When layering light you build up a scheme combining different effects; general light, feature light and task light. Each of these can be achieved in different ways, for example, downlighting, uplighting, wall washing and specific highlighting. To develop a scheme, one has to use at least two elements and the best schemes may involve three or four elements. Each effect can be considered as a layer of light. How do you layer the lighting in a living room? Take the living room above. The ambient light may be a table lamp. This is also the general light. The Feature light could be a directional spotlight, such as our Polespring LED downlight onto a wall or focused on the centre of a coffee table. Combine this with the added highlight of an uplit fireplace, an uplit window reveal or a backlit bookcase and now we have different layers of light. Ensure that each layer of light is controlled independently. This enables different scenes or mood of light to be created. Usually bright scenes will not include the highlight. These come into play once the general light is dimmed and add the evening magic. What are the best ways to layer lights in a bathroom? In a bathroom the general light could be from downlights or an uplit cove above. Task lights could be a pair of wall lights either side of the mirror. 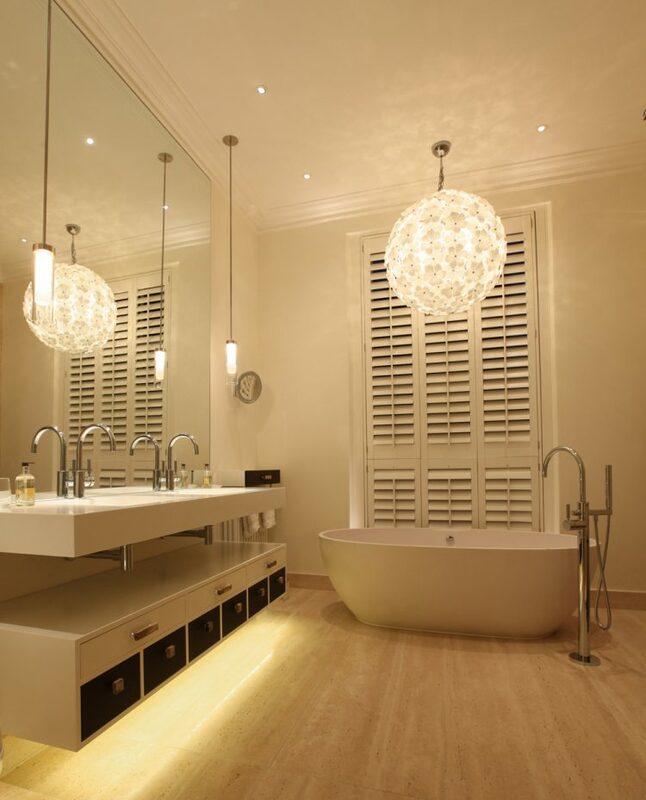 Feature light could be a low level floor washer, a lit niche or an uplight behind a free standing bath. By balancing these effects individually it is possible to transform a bathroom from practical during the day, to an evening spa. Do you layer light in a corridor? Corridors can be so boring, but layering light will transform these spaces. For a standard narrow corridor, you could just use downlights. Think of off centering these and use to light artwork on one side and potentially uplight a textured wall on the other. The asymmetry adds drama. A narrow corridor could have a row of downlights. This would just provide arcs of light half way down the wall. Uplight the end wall, putting a sculpture in silhouette and use a narrow spot of light as a focus. Light the corridor with low level floor washers such as our Cazalla LED steplight. These literally decorate with light. 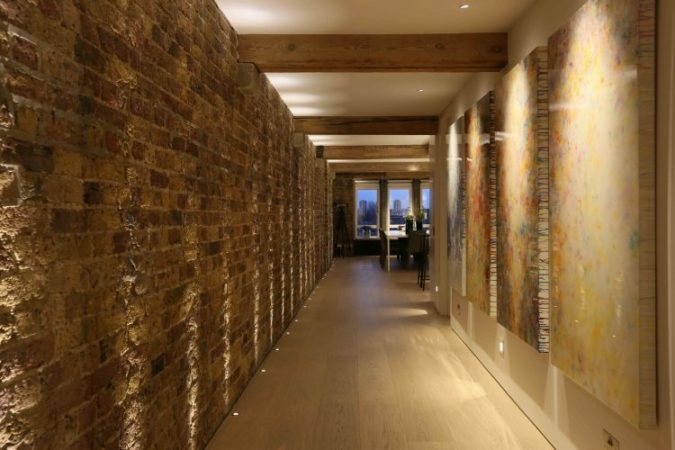 When it comes to a wider corridor, use decorative wall lights and add a lantern to provide general light. Create a feature focus using narrow Polespring LEDs. A highlight is achieved with uplights to the door reveals and windows. Combining these effects will layer light and dramatically change the mood in the low lit settings so that the uplights almost appear as night lights. What are the best techniques to light a shelving unit? 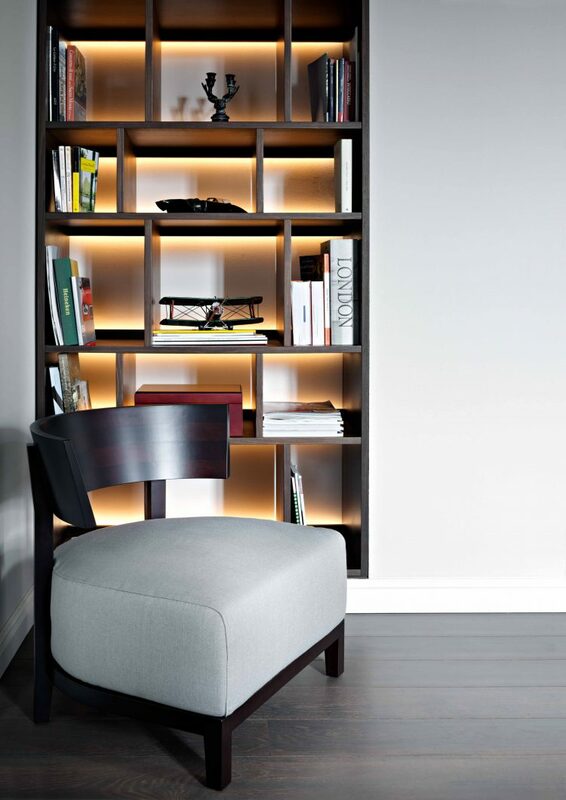 In the past a set of shelves could be considered only as storage, but now they have the ability to become an art feature when lit and styled correctly. Shelves can come in different finishes, and each finish, whether lacquer, mirror or swede backed, will call for a different lighting solution. 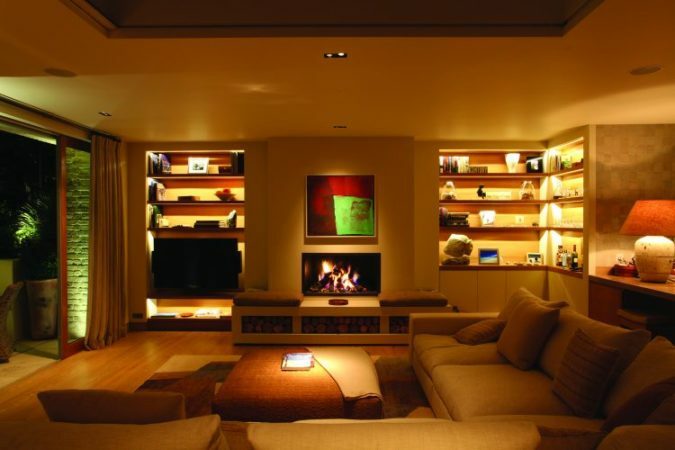 The simplest solution is to front light using an LED strip concealed behind a baffle at the front of the shelf. Another simple solution is to create a backlight effect. This is a more of a dramatic effect, creating depth in the room. If the shelf has a great deal of depth, John Cullen Lighting’s new miniature Luccini (above left) is perfect. The fitting appears as if a jewel, providing stunning focus of light. For a shallow shelf, downlight using our Eyelid undercupboard light (above right), which will give off a soft wash of light. The eyelid feature shields the light source so no downstand is required to hide the source to minimise glare. The Footlight is another unique way to use a small fixture at the front of a shelf. This fitting directs light back at an object, which is particularly effective with glass finishes as the patterns of the object are projected to the back. How do you control different layers of light? 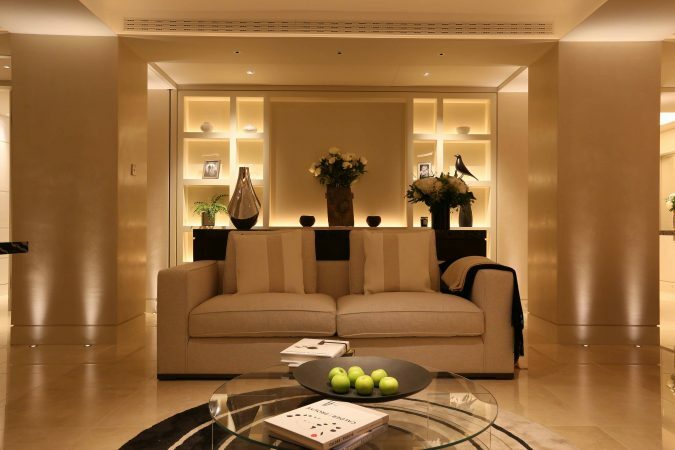 For best results in achieving a layered lighting scheme, do use one of our lighting designers. Contact us on 0207 371 9000 or email our design team or make an appointment. For more inspiration, visit our Project Showcase.